Here is the fire box wrapper in progress. 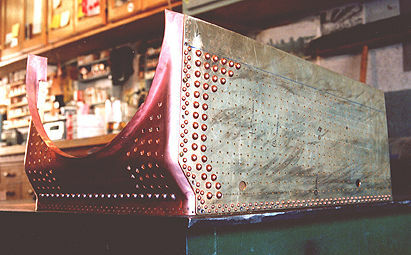 The throat sheet portion was formed up from 1/16" copper. 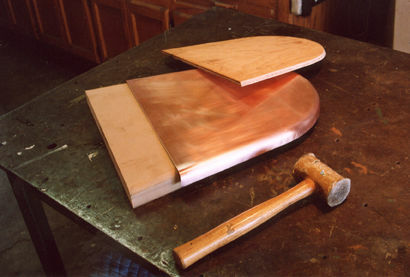 When annealed, copper is very soft and can be worked over the MDF (medium density fiberboard) form. The side sheets are 1/16" brass and still need to have the 3/32" pop rivets installed to simulate hollow stays. On most model locomotives, #4-40 acorn nuts are used to simulate threaded flexible stay bolt caps but the Nickel Plate Berkshires had welded flexible stay bolt caps. To simulate these, 3/16" copper rivets were used. 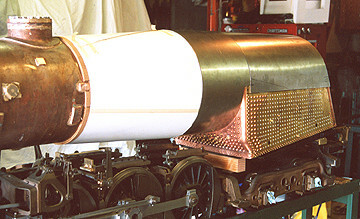 A back head wrapper gives a finished appearance to any locomotive. Making a backhead wrapper is pretty simple. And this photo explains it better than words. 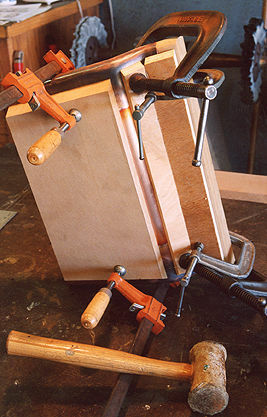 Forming the fire box throat sheet wrapper. This is made of .062" copper. Fitting the boiler jacket is always a fiddle. Get some large sheets of poster board and cut and trim them till they fit. The nice thing about paper patterns is if you cut too much off, you can put it back with some masking tape. When the paper patterns fit just right, use them to mark out the sheet metal that will be used.